Follow Foods For Long Life on FACEBOOK ! Carrot juice is so good for you but it generates massive amounts of pulp. And, to be totally honest, I often throw it out. It breaks my heart to discard something so colorful and beautiful. To relieve the guilt, I often save it, even freeze it. But eventually, most of it ends up in a compost pile or down the disposal. But this week, when we broke out the juicer, I was determine to give this pulp a better fate. I decided to make raw crackers. I have 2 dozen raw foodists coming over tonight for a potluck so they will go to good use! 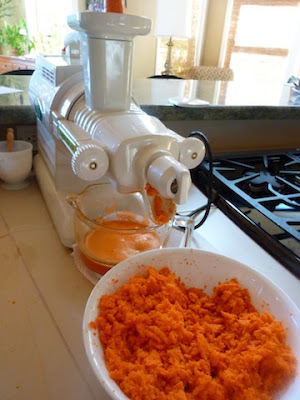 Carrot pulp also has high antioxidant activity due to polyphenol compounds and other phytochemical components. Bottom line is, the stuff I've been throwing away is packed with fiber, important minerals and antioxidants! By the way, people on a raw food diet are ALWAYS looking for raw sources of calcium and iron. This is a bonanza! Let's make some crackers! Making carrot juice creates massive amounts of pulp! I just soaked some flax seeds, added a few juicy tomatoes (sadly, the last of my summer crop), a bit of salt and freshly squeezed lemon juice and voila! Mix flaxseeds with water in a large bowl and soak until all water is absorbed, about 4 hours. When flaxseeds are ready, process tomato, lemon juice and salt in a blender until liquified. Add to bowl along with carrot pulp. Mix thoroughly. If too dry, add a touch of water. Drop a measured tablespoon of pulp mixture on non-stick dehydrator sheets and, with the back of a spoon, gently press down to form and shape round crackers. Dehydrate at 105 degrees F for 8 to 10 hours (I usually do this overnight). Flip crackers over, remove sheet, and place directly on mesh sheet. Dehydrate until crisp (another 6 hours or so). Remove and serve. Save in an air-tight container. Just 3 crackers supplies 1 gram of ALA omega-3 fatty acids! Best Vegan Whole Grain Banana Bread - Healthy And Delicious ! Less Oil, Low Sugar With Walnuts, Chocolate Chips Or Both. Perfect For Holiday Gift Giving! Doug's Banana Bread Goes Vegan! * Use less sugar and add a few packets of stevia for added sweetness. * Replaced the eggs with "flax eggs" . * Reduce the amount of extra virgin olive oil and use apple sauce to make up for the moisture. * Use King Arthur White Whole Wheat Flour for whole grain goodness with the light texture of white flour or use 1/2 all purpose flour and 1/2 regular whole wheat flour. For a gluten free version, use gluten free all purpose flour and xanthan gum. Is it Breakfast or Dessert? If you are serving it for breakfast or brunch, make it with walnuts. For a healthful dessert, make it with vegan chocolate chips. I like it with both walnuts and chocolate chips! The holidays are coming and this makes the perfect gift for friends and neighbors. 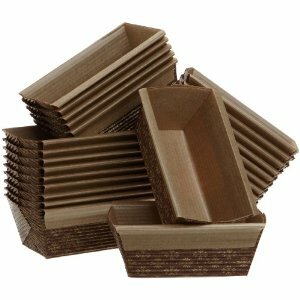 Instead of the aluminum foil pans you normally see for gift giving, try using a decorative paper loaf pan. I bought some in San Francisco's Japan town but I just found them on Amazon. Chocolate chip banana bread makes a great holiday gift. Use these decorative paper loaf pans. * For a gluten free banana bread, replace wheat flour with same amount of gluten free all purpose flour and 1 1/2 teaspoons xantan gum. Preheat oven to 350 degrees F and grease an 8.5" x 4.5" glass baking pan. In a small cup, make flax eggs by beating ground flaxseed with water. Beat well and set aside. After a few minutes, beat again until gooey. In a large bowl, add oil, sugar, applesauce and vanilla and beat with a hand mixer. Add mashed bananas and flax eggs and beat again until well combined. In another bowl, mix flour, stevia, baking powder, baking soda and salt. Add to wet ingredients and beat until well combined. Fold in walnuts (or chocolate chips). Pour batter into prepared pan and let sit for 5 minutes. Bake for 45 to 55 minutes or until a toothpick comes out clean when inserted in the center of the loaf. When done, remove from oven and cool in pan for 10 to 15 minutes. Carefully cut around the edges with a knife and turn over to remove loaf from pan. Place loaf upright on a cooling rack for another 15 minutes. Slice and serve. Per serving (with walnuts): 189.4 calories, 8.8 g fat, 1.0 g saturated fat, 0.8 g omega 3 and 2.5 g omega 6 fatty acids, 0 mg cholesterol, 3.8 g protein, 24.4 g carbohydrates and 3.3 g dietary fiber. Per serving (with vegan chocolate chips): 188.6 calories, 7.4 g fat, 1.8 g saturated fat, 0.3 g omega 3 and 0.7 g omega 6 fatty acids, 3.4 g protein, 28.2 g carbohydrates and 3.0 g dietary fiber. How To Improve America's Productivity By Changing Our Eating Habits - Which Plant-Based Diet Is Right For You? What's The Difference Between A Vegetarian, Vegan, Flexitarian And Pescatarian Diet? With the unemployment rate still hovering around the double digit mark and most of our jobs moving offshore, we might wonder what we can do to turn that around. We can't do much about the wage disparity between American workers and those in third world countries but we can do something about our productivity. A new Gallup study about the health of American workers and their productivity was released and the numbers were shocking! * Only 1 in 7 workers had a normal weight and no chronic health problems. * Said a different way, 86% of American workers are overweight or suffer a chronic health problem. * This causes 450 MILLION missed days of work per year. * And resulted in $153 BILLION in lost productivity. I wonder how we are going to become a thriving nation again with statistics like that? Is it because of our Diet? Have you been to the Heart Attack Grill? Seriously, a new restaurant in Las Vegas specializes in food that is bad for you and features a menu item called the "quadruple bypass burger". They even have a hospital theme where the owner is "Dr. Jon", the servers are dressed as nurses and the patrons are given hospital gowns (I'm not making this up!). An ambulance is parked out front which I'm sure is convenient for those ordering their 8,000 calorie meal. Oh, did I mention, patrons over 350 pounds eat for free! Yes, it's clear that our diet has led to these numbers. That and the pervasive attitude that it's fun to eat food that is bad for you. Many people want to turn this around. Usually it's when they suffer a heart attack or get the bad news that they have diabetes. But the good news is that, in many cases, health can improve and it's as easy as picking up a fork! (By the way, if you haven't seen Forks Over Knives yet, it's a must see). But selecting a new diet can be difficult and many people need a regimen that appeals to them and one that they can stick to. Is there a perfect diet? I don't think so. We are all built differently, place different demands on our bodies, live in different geographies, etc. So a diet that works well for one person may not work for another. Also, a diet that appeals to one person may not appeal to someone else. One person may have life changing results by eliminating all animal products from their diet and another feel better by eating a mostly plant-based diet and occasionally eating fresh eggs or having a piece of fish. Many people may start out by eliminating red meat from their diet and a year later they may have eliminated pork and chicken too. You just have to do what works best for you. A vegetarian is someone who does not eat meat, poultry or seafood or any products that come from those foods (like gelatin or rennet). Besides fruits, vegetables, beans, grains, nuts and seeds, lacto-ovo vegetarians eat cheese and eggs. A lacto-vegetarian eats dairy products but no eggs. An ovo-vegetarian eats eggs but no dairy products. A “healthful” vegetarian diet includes lots of fresh fruits and vegetables, whole grains, beans, nuts and seeds. If dairy is consumed, it should be reduced fat, organic, free of rBGH (Bovine Growth Hormone), and used in moderate quantities. Dairy products are a source of high quality protein and contain vitamin B12 (nutrients missing in plant food). However, its consumption poses some health concerns and scientific evidence questions its health benefits. * Dairy products have little or no benefit for bones. * Cholesterol and saturated fat in dairy can contribute to heart disease. * Breast, prostate and other cancers have been linked to the consumption of dairy products. * Many people are lactose intolerant because they lack the enzyme that digests milk. Eggs contain vitamin B12, and are a source of high quality protein. If eggs are consumed, they should be pasture raised and eaten in moderation due to their high content of cholesterol. According to Egg testing by Mother Earth news, pasture raised eggs have 1/3 less cholesterol, 1/4 less saturated fat, 2/3 more vitamin A, 2 times more omega-3 fatty acids, 3 times more vitamin E, 7 times more beta carotene and 4 to 6 times more vitamin D! A vegan diet is a plant-based diet that excludes all animal products, even milk, eggs and honey. In addition to the enormous health benefits of this eating a vegan diet, most vegans are primarily motivated by compassion and the desire not to harm or kill animals for their food or subject any animal to the cruelty of factory farming. Many vegans also wish to avoid the devastating effects of animal agriculture on the environment. * Over 10 billion factory farmed animals, who live unnaturally and are treated inhumanely) are slaughtered for food in the US each year. * Animal agriculture is responsible for more greenhouse gas emissions than all forms of transportation. * Factory farming pollutes our rivers and streams with massive amounts of antibiotics, hormones, pesticides and other toxic chemicals which end up in our drinking water. * One third of the earth's entire land surface, more than half the water and over 1/3 of the petroleum is depleted by factory farming. * 800 million more people could be fed if most of the grain in the U.S. wasn't used for animal agriculture. Raw food vegans, as other vegans, exclude all animal food. They typically eat a diet composed of at least 75% raw food made up primarily of raw fruits, vegetables, nuts, seeds and sprouted grains and beans. 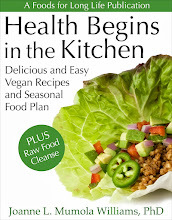 Foods are considered raw if they have not been heated above 105 to 118 degrees F. Raw food vegans typically select this diet to address a severe health issue, like cancer, heart disease or diabetes, or to achieve remarkable health. Eating food in it's raw state provides more phytochemicals, prevents the loss of heat sensitive vitamins and essential fatty acids and gives you the benefit of live food rich with enzymes.As beneficial as it is to eat lots of raw food, I do not think a 100% raw food diet is optimal unless you are doing it for a short time as a cleanse or you are trying to maintain a pristine environment for your body to fight a serious disease. There are some key benefits to including some cooked foods in a raw food diet regimen. For one, it's easier to consume beans and grains that are a great source of protein, fiber and low fat calories. It makes it a bit easier to socialize with your friends and family (a 100% raw foodist can become isolated) and in the winter, you may crave some warmer food. Flexitarians, or Semi-Vegetarians are people who mostly eat a vegetarian diet but occasionally eat meat, poultry or fish. For example, many people avoid red meat, eat mostly vegetarian meals but include chicken or salmon in their diet a few times a week. More and more people are drawn to this diet because of data showing the many health benefits of eating less meat. Allowing for the occasional chicken breast or grilled salmon steak makes it easier for those who have trouble sticking to a veggie diet all of the time. A “healthful” flexitarian diet includes lots of fresh fruits and vegetables, whole grains, beans, nuts and seeds. Dairy should be minimized but if consumed, should be organic and free of rBGH. Eggs, if consumed, should be pasture raised and eaten in moderation due to their high content of cholesterol. If fish is part of the diet, it should be wild, line caught, sustainable and low in mercury. When meat is consumed, it should be lean, range fed and hormone free. Red meat should be avoided or eaten sparingly. The American Institute for Cancer Research recommends limiting the consumption of red meats and avoiding processed meats completely. Cultivate Research, a market research company for the vegetarian food industry predicts “The semi-vegetarian segment has the potential to grow to one-third of the U.S. adult population.” Ironically, this demand for vegetarian food is probably what’s driving more meat-free entrees in restaurants and products in mainstream grocery stores and not the demand from committed vegetarians, the 3% of the adult U.S. population who never eats meat, poultry or seafood. According to a 2005 survey by Cultivate Research, 13% of adults are semi-vegetarians or individuals who eat meat with fewer than half their meals. A pescatarian is someone who avoids all meat with the exception of fish. Some pescatarians consume eggs and dairy. Given the benefits of a healthful vegan diet coupled with the high concentration of long chain omega 3 fatty acids (DHA and EPA), vitamin D and vitamin B12, critical nutrients missing from a strict vegan diet, a pescatarian diet can be extremely beneficial - especially if dairy and eggs are minimized or avoided. A “healthful” pescatarian diet includes fish, lots of fresh fruits and vegetables, whole grains, beans, nuts and seeds. Fish should be wild, line caught, sustainable and low in mercury and chosen for its high content of DHA and EPA omega-3 fatty acids. For example, it only takes 2.6 ounces of cooked Pacific oysters or 1.9 ounces of wild Atlantic salmon to get 1 gram of (EPA and DHA) omega-3 but it would take almost a pound of catfish or haddock! Omega-3 is critical for cardiovascular health, strengthening the immune system, lowering the risk of stroke, cancer and inflammatory conditions like rheumatoid arthritis. Recent studies link depression, ADHD and hyperactivity with low levels of this critical fatty acid. Omega-3s are especially important for pregnant and nursing women, and young children as DHA is needed in very high concentrations for the development of the brain. For adequate omega 3, fish eaters are encouraged to consume two 6-ounce servings of per week of the lowest mercury seafood with the highest amounts of omega-3 such as: Pacific oysters, anchovies, Pacific herring, Atlantic chub, wild salmon, Atlantic sardines and American Shad. The Monterrey bay aquarium publishes a Super Green List that tells you what fish have low levels of contaminants, provide at least 250 mg of omega-3 and are are caught or raised in the most environmentally friendly ways. Whatever diet you decide on, one thing is for sure. 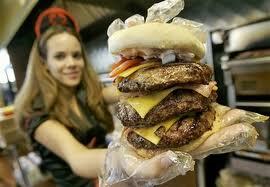 You should pass on the "triple bypass burger"! Easy Party Lentil Salad With Fresh Corn And Red Bell Pepper. Vegan, Gluten Free And Inexpensive To Make! Inspired by Alice Waters - Perfect for a holiday gathering! With the holidays approaching, you'll soon be looking for party recipes. Here's a quick and easy dish that's stores well so you can make it earlier in the day or even the night before. Lentils cook quickly, unlike other beans, and are an affordable way to feed a crowd. Because the salad is vegan and gluten free, all your guests, irregardless of their eating preferences, can enjoy it! Not having a party? Feel free to cut the recipe in half and serve it for lunch or dinner. * For those of you who don't eat read meat, lentils are a great source of iron. One cup provides a third of your daily requirements. * You heart will be happy! Studies have shown that you have a much lower risk of heart disease when you eat high fiber legumes. One cup of lentils provides 16 grams of fiber - nearly two thirds of your daily requirement! The high fiber content also helps lower your cholesterol level. And lentils have zero saturated fat and cholesterol. I told you your heart would be happy! * All that fiber also stabilizes your blood sugar making it a wonderful food for those with diabetes or hypoglycemia. * Tired of people asking you where you get your protein? These powerful legumes contain 18 grams of protein per cup. Together with corn (which provides the amino acids methionine and cystine) you have a complete protein! * If you do not have flaxseed oil, omit and increase olive oil from 3 to 4 tablespoons. The addition of flaxseed oil improves the balance of omega-6 to omega-3 fatty acids to 1:1. When you buy flaxseed oil, make sure it is cold pressed and has a "press date" to make sure it's fresh. It should be in the refrigerated section of the grocery or health food store. Sort through the lentils removing stones or clumps of dirt and rinse well. Cover with water and bring to a boil. Lower to simmer and cook, partially covered, for 25 to 30 minutes until cooked through but not mushy. Drain. In a large bowl, toss the hot lentils with vinegar, salt and pepper. Adjust seasoning to taste. Mix olive and flaxseed oils with lemon juice and add to the lentils along with bell pepper, onions, corn, carrot and parsley. Mix gently until combined and serve. If you are planning to make it the night before, don't add the fresh parsley until you are ready to serve it. Also, remove from refrigerator an hour before serving so it can get to room temperature. Per serving: 206.1 calories, 6.2 g fat, 0.7 g saturated fat, 0 mg cholesterol, 0.8 g omega 3 and 0.8 g omega 6 fatty acids, 10.9 g protein, 27.9 g carbohydrates, 12.9 g fiber and 243.8 mg sodium. More Bad Press For Vitamin Supplements - One Article Links Daily Vitamin Use With Increased Mortality For Older Women And Another Links Vitamin E To Prostate Cancer! The sale of supplements is an $11 billion dollar business! I always have mixed feelings about articles reporting on the risks of vitamin supplements and I've blogged on this topic before. On one hand, I think people really need to be careful about taking unnecessary vitamins and I'll talk more about that in a bit. On the other hand, I always feel as though the pharmaceutical companies are cheering on, and maybe even funding, any study that would disprove the ability to improve health without their drugs. But paranoia aside, let's discuss vitamins. The first article, published in the journal Archives of Internal Medicine, disclosed a higher risk of death among women, ages 55 to 69, who used certain supplements. The highest risk was among those taking iron, especially those exceeding a daily dose of 50 mg per day. This should not be a surprise since women in that age group who are postmenopausal have very little need for supplemental iron. Younger, menstruating women may need to supplement with this mineral as iron is needed to manufacture hemoglobin in red blood cells, but only if they are anemic. If iron is not needed, the body stores it (this pertains to everyone - men and women). Stored iron produces destructive free radicals (think "rust") and this can lead to heart disease, cancer and accelerated aging. Even if you avoid taking iron supplements, you may still get more than you need from eating fortified cereals like General Mills Whole Grain Total that provides a whopping 24 mg per serving. The RDA for adult men and post-menopausal women is only 8 mg! For more information of iron, see my post of Best sources of iron - how to help avoid iron deficiency anemia and toxicity. Other vitamins that were associated with an increase of death were vitamin B6, folic acid, magnesium, zinc and copper. Their link with increased death was not as statistically meaningful as iron. Only calcium was associated with a reduced risk of death of 3.8% but there was no added benefit of taking more than 900 mg per day. Personally, I think taking calcium in the amounts doctors often recommend (often exceeding 1,000 mg per day) is excessive. Too much calcium (especially if you take calcium carbonate which is not as absorbable as calcium citrate, for example) can increase the risk of kidney stones. I have two friends who pop calcium pills as if they were M & M's. They have both had kidney stones and false positive mammograms that were just "calcifications" in their breast tissue. Hey, it's got to go somewhere! The second article, published in the Journal of the American Medical Association, found a follow-up of the participants in a cancer prevention trial who supplemented with vitamin E, had a 17% increase in prostate cancer compared to those who took a placebo. This was unexpected since previous animal studies and other findings demonstrated that vitamin E and selenium showed promise in preventing the disease. I was surprised to find that the form of vitamin E used in this study was alpha-tocopherol. Vitamin E is a family of nutrients consisting of alpha, beta, delta and gamma tocopherols. I think the study would have been far more significant if mixed tocopherols were used. Given their choice of vitamin E used in this study, I would recommend they return to the drawing board. In the meantime, gentlemen, eat sunflower seeds- a safe and healthful source of this vitamin! * Vitamin supplements can be potent. Vitamins can cause extreme reactions in your body, especially when taken in excess. Vitamins can interact with certain drugs and with each other. For example, vitamin E has blood thinning properties and can be dangerous if you are taking drugs like Coumadin. Calcium can significantly reduce iron absorption. These are things you need to know. * Not all supplements are alike. Some vitamins are synthetic and others are derived from real food and provide a more absorbable "whole food complex". Companies like New Chapter make supplements that are made in this manner and can even be taken on an empty stomach. Synthetic vitamins often are so strong, they can give you an upset stomach. * Are you deficient? Ask your doctor for a vitamin panel and if your blood tests reveal a deficiency in a certain vitamin, then consider supplementing. Certain drugs and conditions can deplete vitamins. For example, taking statins can deplete coenzyme Q10. Drinking alcohol in excess can cause a deficiency in B-complex vitamins. Taking precautionary supplements in certain situations like these may be beneficial. * Certain diets require supplementation. If you avoid all animal food, you will need to supplement with vitamin B12, DHA and EPA omega-3 fatty acids and most likely vitamin D or eat foods fortified with these nutrients. * See through the hype. The sale of supplements is an $11 billion dollar business and attracts many unscrupulous people. The industry is not regulated and literally ANYONE can make a supplement, advertise in a magazine and sell their product. So make sure you do your due diligence on the company, read the published literature, work with a competent holistic nutritionist or naturopath and make your decision carefully. The bottom line is this - your best bet is to get your vitamins and minerals from food. It's unlikely that you can eat an abundance of fast food, skip your fresh fruits and vegetables, pop a few vitamin supplements and avoid ill health. Having said that, there are a few nutrients that I think most people are deficient in - vitamin D, EPA and DHA omega-3 fatty acids. Unlike others, the research involving these supplements has shown great promise in preventing many degenerative disorders. But that's a topic for another day! Tofu Scramble With Artichoke Hearts, Mushrooms And Spinach - A Hearty Vegan Breakfast! And it provides 19 g protein and 9 g of fiber! Like so many others, my brother-in-law is trying to reduce the amount of meat, cheese and eggs in his diet. When people turn to a vegan diet to improve their health, it's often difficult to give up certain traditions, like that hearty weekend breakfast.This dish will not leave anyone feeling deprived! Sprinkling a bit of turmeric on crumbled tofu gives the dish the appearance of scrambled eggs. The rest of the yummy ingredients - mushrooms, artichoke hearts, fresh spinach and red onions, speak for themselves! Serve with a few slices of heirloom tomatoes, a whole grain or gluten free English muffin with Tofutti dairy-free cream cheese and of course, my favorite Low Sugar Strawberry Jam, and you've got yourself a magnificent weekend breakfast! Turmeric makes crumbled tofu looked like scrambled eggs! Turmeric contains curcumin, which has strong anti-inflammatory properties and many health benefits. Squeeze excess moisture from tofu. Crumble into a bowl leaving some bigger chunks. Sprinkle turmeric and salt over tofu and gently toss to combine. Heat oil in non-stick frying pan and cook onions for several minutes. Add mushrooms, additional salt (if desired) and pepper and cook until mushrooms release their moisture. Cook until moisture is mostly cooked off. Stir in artichokes and tofu and heat thoroughly. Stir in spinach and cook until it wilts. Serve with slices of fresh heirloom tomatoes and toasted whole grain muffins with your favorite vegan spread. Per serving (without tomato slices and muffin): 250.2 calories, 12.7 g fat, 0.7 g saturated fat, 0 mg cholesterol, 0.7 g omega-3 and 5 .4 g omega-6 fatty acid, 18.8 g protein, 13.6 g carbohydrates, 9.1 g fiber and 759 mg sodium (with addition of optional 1/4 t salt). Without "optional" salt, 430 mg sodium. Saving Tomato Seeds For Next Year's Garden - Fermenting Is Key! These furry little seeds will be next year's tomato plants! Have you grown a favorite tomato this year or just found one in the farmer's market? Do you want to eat it again next year? I bought and planted 6 heirloom tomato plants this year and my friend, Ray, gave me 6 more. Each of them was marked with their names on a little stick. My garden is now filled with huge tomato plants coming to the end of their productive season and unfortunately, all the little sticks have rotted and I can't remember the names of any of the plants! Well, this wouldn't be a problem except there is one tomato that I MUST plant again next year because it is simply the best tomato I've ever eaten! It's big and dark red with a green top. It's flavor is delicate and not too acidic. So I decided to save its seeds. The tastiest tomato in my garden! I'm embarrassed to say that I've never saved tomato seeds. In fact, I've always planted tomato starts instead of seeds because I'm lazy and love instant gratification! And, the nurseries always have such a cool selection of heirloom tomatoes. Enough excuses, this year I'm going to plant these seeds. I thought you just dried them but after speaking to my resident expert gardener (my daughter-in-law, Karina) and researching some websites, I found that you have to ferment the little guys. Here's the process in detail. It takes a few days, it gets a little gross but it's very easy. First of all, you can only do this with heirloom tomatoes so don't pick a hybrid. Heirlooms are "open pollinated" or pollinated by nature, not by crossing plants. Pick the best looking tomato on the vine when it's perfectly ripe. Don't worry - after taking out the seeds, you'll be able to eat it. Cut the tomato across the "equator" of the fruit. Scoop out the seeds and place in a small glass jar. Label the jar with the name of the tomato. In my case, I just labeled it, "big red tomato". Next year I'll probably be wondering what that means. Add about 1/4 cup of water to the seeds. Cover the jar with a paper towel or plastic wrap and punch a few holes into the top so there is enough air for the seeds to ferment. Put in a warm place and let it sit for 2 or 3 days. Step # 4 - Get Funky! In a few days, a funky mold will grow on top of the seeds. This means the gel coating around the seeds has broken down. Remove the mold (I just pulled it off with a fork) and rinse the seeds in a fine mesh strainer. Pour the seeds into a find mesh strainer and wash thoroughly until they are clean. Place them on a waxy paper plate and dry completely. Move them around occasionally so they don't stick. Even if they do, you can gently scrape the seeds off the plate. Label the paper plate with the name of the seeds. 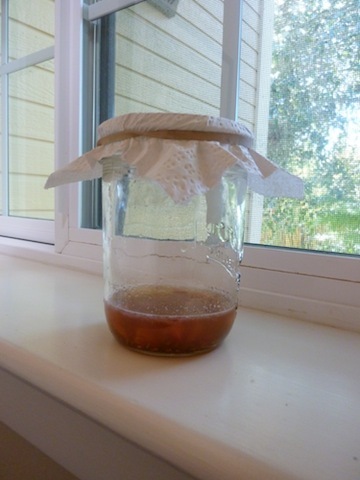 When they are completely dry, place in a little paper envelope or a small plastic baggy. Label with the name of seeds and the date. If you did a good job, the seeds will be cute and fuzzy! Place on waxy paper plate until completely dry. This, perhaps, will be the hardest step for me. In the middle of winter, the last thing on my mind is starting seeds. Then one day, I'll look up, it will be warm and I'll say, "time to plant" and run out to the nursery and buy starts. So this year, I'm going to make a big effort to use all the wonderful seeds I'll be saving and that Karina has sent me from her garden.